While I was busy at the Soda Pop Shop in Scottsdale taking photos of the amazing soda and beverages in stock, I found this tray of candy on display. Asking the clerk for more information, I learned that these candy treats are legal because they are labeled "candy sticks" instead of "candy cigarettes". There is no question that the inference of this packaging and the display tray that the boxes are meant to be as cigarette packs. 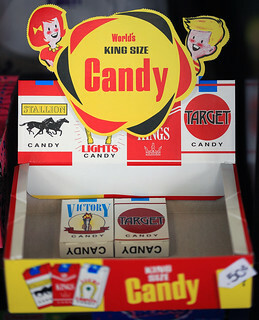 I was thinking back and figure that the first time I remember seeing such candy cigarettes was back when I was about 6. Even then I knew they were "adult" things that were a bit "forbidden". I remember going to the small grocery store near my grade school and getting similar candy treats when I was about 9. I thought it was "cool" then. Now I see them and wonder if in any way, the subliminal allure of the graphics and packaging affected me. Although I was not a smoker for most of my life, I did pick up the habit in the last 18 years and while I do not smoke cigarettes, I do use tobacco . Now I see this display and wonder at the power of it all. The graphic design, colors and packaging really are attractive and stick in your memory. I am betting my young grandchildren would see these and somehow have it stuck in their memories too, even though everyone around them is careful not to smoke in their presence. Hmmmmm, thoughts that come along when you are not thinking about anything in particular. Hmmmmm, indeed. I agree with your point, although in my case I have never smoked at all. I assume the "sticks" still have the red tips they used to have back when you and I were kids. Those, of course, similated the burning end of the cigarette. Kids would "smoke" them for a few minutes, trying to look cool, and then eat the things, but in the meantime the not-so-subliminal message would obviously have been delivered. I wonder how many people at least sowed the seeds of a later habit by consuming candy cigarettes when they were children. Oh my, over analyzing a bit? It made us feel like adults and play actors like guns and cowboy boots, toy trucks, toy cars, etc. As you know I am a smoker but never thought about it until I was in college and even then smoked two years before a "friend" taught me to inhale. Great photo though I expect they were much cheaper back then – 5cents?